In college, John Smith-Ricco did not have business ambitions; instead, he intended to pursue advanced degrees in history aimed at a career as an academic. But a research fellowship in South Africa changed his perspective. "I was studying how rural isiZulu-speaking people interpreted their constitutional rights, how politics in South Africa has become less ethno-centric, gravitating to a one-party state," says John. As part of his research, John interviewed a number of people; one with an elderly man particularly stood out. "He said, ‘You know, during Apartheid, we didn’t complain about not having work because we knew why — the problem was race. Now we have democracy and a Black government — but we’re still poor.’ I saw a major disconnect among everyday people between the expectations they once had and what the end of Apartheid really meant for their quality of life. The experience got me thinking about the role of industrialization in economic development. The viability of South Africa depends on that development and the equitable distribution of resources." Eager to learn "how capital is created," John accepted a position at General Mills that offered him an unusual amount of responsibility for profit and loss. Over his four-year tenure there, John helped manage familiar brands such as PopSecret popcorn, Fruit by the Foot, Fruit Roll-Ups, and Progresso Soup. Whether he stayed at General Mills or not, John recognized he needed an MBA in order to advance. More importantly, he says, "I wanted to discover what business could do for the world. If I wanted to have an impact outside of packaged foods, I needed additional skills." Right away, HBS stood out for the case study method and its general management focus. "The school isn’t trying to create functional experts," says John, "but managers who understand all business areas and can be flexible leaders." He had expected to find a student body "over-represented by bankers and consultants," yet found himself "surprised by how multi-faceted everyone is here. The business titles don’t really speak to their passions or the ways in which they contribute on campus. At the Social Enterprise Club and Conference, for example, so many different kinds of people participate and are eager to share what they’ve learned and experienced." During January term, John returned to Africa via the Rwanda IXP, focused on "enterprise and nation-building in a post-conflict society." John and three other HBS colleagues worked with an umbrella organization providing marketing and sales services to seven or eight coffee cooperatives. "It started as a marketing issue," says John, "but it became clear there were business-management issues they really needed to address. We recommended ways to consolidate debt that would benefit their farmers." This summer, John will assume his first consulting position with Bain & Co. in New York, a role "that represents an opportunity to meet people from many different industries and gain skills applicable to all of them." If the experience proves fruitful, John may return to consulting after graduation. His larger ambition, however, remains international in scope. 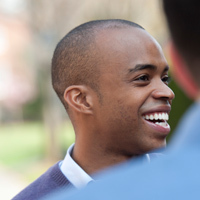 "I’m not sure of the role or industry," says John, "but I want to be directly connected to emerging markets in Africa, where I can help encourage sustainable democracies with development tied to economic growth and job creation."